I'm back after a brief and unplanned hiatus. I didn't get the news I hoped for last Thursday when I attended my Consultant appointment so I really just wasn't in the right frame of mind to blog, which meant that I decided to take a few days off and spend them with my family, which was a great distraction. Then I was ready to post on Tuesday but when I woke to the horrific news from Manchester, I felt it wasn't appropriate to post about beauty. I am lost for words & can't even imagine the pain of the people in Manchester but my thoughts are with everyone there. Today's post is another brand focus and this time it's all about Becca, a brand that flew relatively under the radar until Jaclyn Hill began to rave about the highlighters and then went on to collaborate with them on the famous Champagne Pop. They are now synonymous with highlighted, dewy, glowing skin and although I don't have the largest collection, I wanted to share my thoughts on the brand with you today. As with all of my brand focus posts, this is not sponsored and, in this case, I bought all of the products myself. I have two Becca primers, the first of which is Backlight Priming Filter. This primer is perfect for dull skin days because it really gives the skin life and adds some luminosity without leaving the skin looking greasy or like a discoball. This pairs particularly well with matte or satin finish foundations, especially if you aren't a fan of highlighters but want to add a little glow to the skin. I also find it to be quite hydrating, yet it doesn't feel like there is an extra layer of product on the skin. It is one of my favourite primers. £32. I was curious about their more recent primer addition - First Light Priming Filter, because it is described as giving "a soft focus gleam" and the lilac colour should counteract any dullness. This primer is lighter in texture than the Backlight primer and the lilac hue dissipates when applied to the skin. This product disappointed me - it literally does nothing for my skin! I think it might work on very yellow/sallow toned, combination skin but my skin is pretty neutral so it just does nothing for me. It isn't a bad product, just not for me. £32. Becca have two foundations to suit both matte and dewy skin lovers. I have the Aqua Luminous Perfecting Foundation, which is not as light in texture as you might expect, given the name. I really dislike pipette dispensers on foundations because they get clogged up easily ( a total first world problem, I know!) and pumps are so much more user friendly! The coverage is light-medium and the finish is dewy but not overly shiny - it's what I wanted Chanel Les Beiges to be. My skin looks very radiant when I wear this foundation and what I really love about it is how well it wears. It doesn't budge at all for a good 8/9 hours (I always use a setting spray but don't always use a setting powder). It also feels weightless on the skin, blurs the look of fine lines and despite being luminous, it doesn't highlight my visible pores. I really, really love this foundation but hope they change the dispenser! £34. Champagne Pop is the product that started my love affair with Becca. The champagne/gold/apricot colour is perfect for my skin tone and the texture is extremely finely milled and so buttery soft, that although it is a powder, it feels almost creamy to touch. It delivers a beautiful sheen without any glittery effect. It is pretty pigmented so a light hand is required if you don't want to be seen from outer space. If you don't think that Champagne Pop is your kind of shade, then fear not because there are a range of Shimmering Skin Perfectors available. £32. 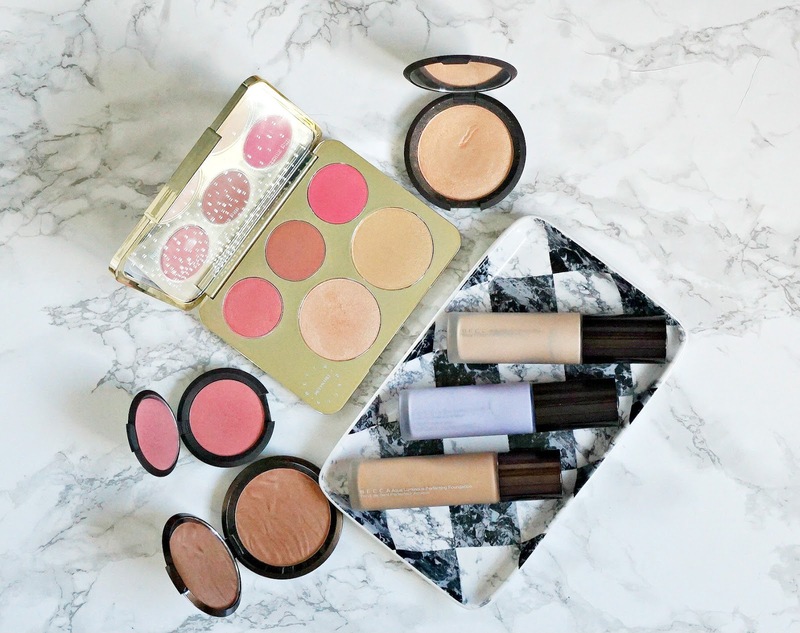 Jaclyn Hill Champagne Collection Face Palette is a product that I have mixed thoughts on. I adore the packaging and obviously love that I have a back up of Champagne Pop because I'm dangerously close to hitting pan on my single pan of it. That being said, I find that I haven't reached for Prosecco Pop very much, which is more golden in tone and whilst I like Amaretto blush, I never really think of wearing Rosé Spritz or Pamplemousse. I prefer a coral blush, whereas these are more pink in tone so really, I should have just bought a back up of Champagne Pop instead of this! I will probably get more use out of the whole palette when I finish my single Champagne Pop as I will naturally be reaching for it more often and that will encourage me to use the other products more. A very light hand is required with the Luminous Blush. I have one single Mineral blush in the shade Flowerchild. I find this formula less daunting than the Luminous Blush because, whilst it is pigmented, it isn't as full on as the Luminous, which I found difficult to work with. I bought Snapdragon in the Luminous Formula and gave it away after a few weeks because it just didn't work for me - that being said, I chose the shade badly but given the price, I didn't want to risk another regret so I went for the Mineral formula when purchasing a second Becca blush. Flowerchild is a peachy-pink with a hint of gold shimmer. It is buildable and the formula is so easy to work with due to the texture and I find that it wears really well on my skin. £26. I recently bought one of their new Sunlit Bronzers in the shade Capri Coast, and I am loving it! I love the pattern on the bronzer itself, which looks like ripples in the sand or waves in the sea. The texture is the perfect balance of soft and firm - firm enough to not feel creamy, yet soft enough to blend well without looking patchy or muddy. I wouldn't describe it as completely matte, yet it definitely isn't as shimmery/luminous as Hourglass bronzers, for example. If you're in the market for a new bronzer, I would highly recommend! £32. If you have yet to try any Becca products, I would recommend one of the highlighters as a good place to start but if you don't really like highlighters, then you can't go wrong with a blush. There are a number of products from Becca that I have yet to try but they are on my wishlist - the Shimmering Skin Perfector Poured (a cream version of their highlighters), Aqua Luminous Perfecting Concealer and Soft Light Blurring Powder to name a few! Have you tried any of these products? Also, I don't know if they sell mascaras or brow products, which seems a little strange! I hope you have gotten an insight into Becca products from this post and I would love to hear your thoughts/recommendations in the comments below. Pur~lisse - when Asian and French skincare meet!